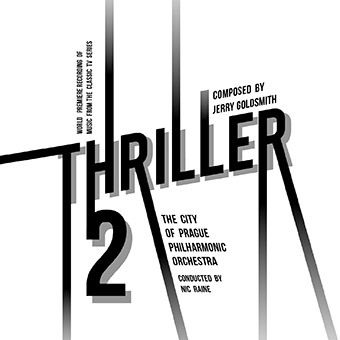 The 536th Soundtrack of the Week is Thriller 2, the second superb re-recording of Jerry Goldsmith's music from the television show Thriller, brought to life by conductor Nic Raine and the City of Prague Philharmonic Orchestra. On the CD are thirteen tracks of music from six episodes of the show, each episodes getting a longish suite of cues in addition to a "Prologue/Roll Call" and, in one case, a nocturne for violin and piano. The sound quality is absolutely stunning, as with all the Tadlow releases, and the performance itself is brilliant. "There are obsessively repeating guitar and piano strikes, tape delays, saxophone that comes barreling out of nowhere, strange wordless vocals, looped figures, numerous layers and textures.."God Grante That She Lye Stille" has the flute as its main voice and there are moments that might remind you of Lalo Schifrin. The arrangement of the suite itself has a definite dramatic shape and pull and is mesmerizing to listen to. "The Bride Who Died Twice" also makes a lot of use of the flute but this time there's a lot of accompaniment from acoustic guitar and percussion and the feel is more exotic, eerier, with more space. Prepared piano, energetic percussion and modern figures alternating kick off the prologue and roll call, which ends with a more relaxed and melodic statement. The suite begins mysteriously with percussion and bells and proceeds to tenser, spikier places, making welcome use of the harp and reminding me of some of my favorite Masaru Sato cues. "The Weird Tailor" uses what sounds like bowed basses and celli with piano and overblown flute to create an atmosphere of suspense and dread. The suite has a lovely romantic section, an excruciatingly gentle and pretty cue surrounded by sonic menace. “Masquerade" begins in a restrained fashion, with some horn and harp writing that sounds a bit like Herrmann. Harp and horns continue to tell a lot of the story in the suite, as does the flute, perhaps the most important instrument overall here. Again there are touches of what sounds like exotica, and of course always tension and excitement. For "The Terror in Teakwood", we start with dissonance and space, with modern stings and pounces. The suite makes a lot of use of the lower register for all the instruments, like subterranean clouds. The percussion sounds are particularly effective, and some of them sound like fast scrapes on the piano strings. The disc ends with the very lyrical and moving "Teakwood Nocturne for Violin and Piano", showing that Jerry Goldsmith could do classical just as sell as modern. These re-recordings of music from Thriller are perfect and exactly the kind of thing that we should be seeing more of.